So since they have a CLI we decided to try to automate this process, its a bit wired what we came up with because we build at deployment time, but it works. You also need to manually add the packages.config for nuget with a reference to octopack. This will package up the files for you into the nuget format octopus needs. Now this will package up our solution to be built on the deployment server, it wont actually do any building. I’ve got a few projects that are odd like this, where i end up pushing from Octopus to a remote environment to then onward deploy, its not unusual I think, but still not common. So we ended up creating a machine specific in one of our setups for just running scripts, in my smaller setup we just drop a tentacle on our octopus server though. 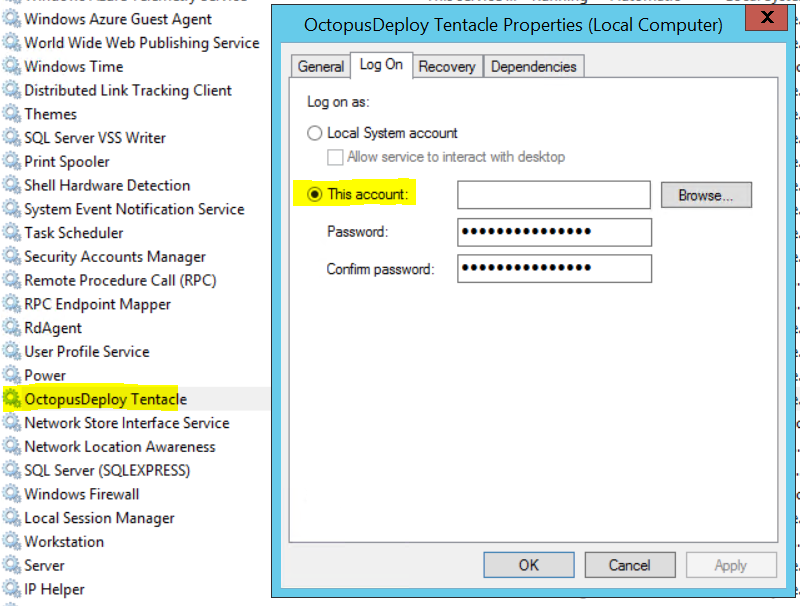 I’m using an octopus server with a tentacle on it in this example. The tricky bit here is that nodejs with AppManager CLI runs out of the User Profile, so What i have done is set the Tentacle on the box to run a a local User Account (if you are in a domain i recommend an AD account), make sure it a local administrator on the box the tentacle is installed on. Make sure you select the substitute Variable Step Feature. The setup the variables in the variable section. And for each variable you will probably want to set a different scope per environment. Now i’ll just walk through a few of the things in the powershell and why we are doing things that way. This code above is for giving the option for various groups to be able to access different deployments. For example, we have Dev and Test, the developers have access to both Dev and Test, but only our testers have access to Test, because we allow the developers to “mess around” with dev, which may cause false positive results in testing. 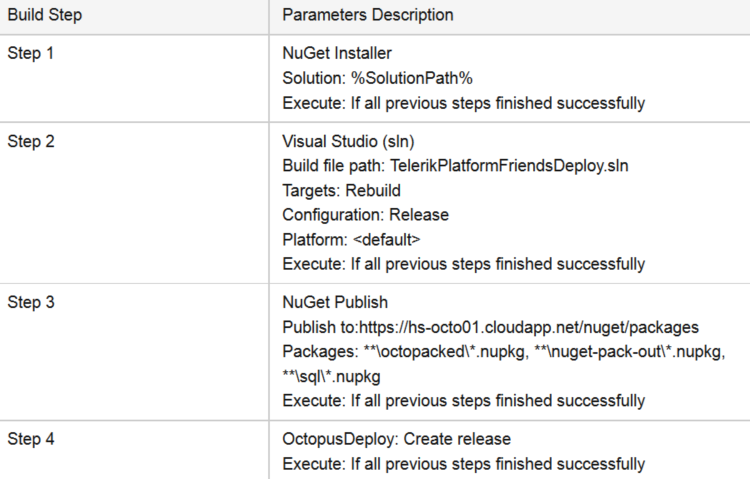 We expect the previous step to this one to be the Telerik Nuget Package step, if it is not this will fail. $JSON | ConvertTo-Json | Set-Content "$parentLocation\.abproject"
We modify values in the .abproject file to set things like the version number and also the app name (we prefix dev with “Dev” and Test with “Test” so using the example above where a developer has both dev and test on their phone, that the developers when they are using the app on their phone know which one is which. We normally set the Group Access list to a variable, so that it can be varied per environment. Once deployed to Telerik Platform our version number are in sync with Octopus and Team City as well as our Source control labels. And we end up with seperate apps for Dev,Test , etc. and in the event you are accessing services you can token replace the right scoped variable so that the “Test Mobile App” accesses the “Test Web API” and so on. This entry was tagged OctopusDeploy, TeamCity, Telerik Platform, TFS. Bookmark the permalink.